The Convex Mirror Shop supplies all goods to the Customer subject to these terms and conditions. The Convex mirror Shop will not be bound by any condition included in the Customer’s order. In the event of any discrepancy between the Customer’s order and these terms of trade then these terms of trade will prevail. The Convex Mirror Shop does not guarantee to supply any or all goods. The Convex Mirror Shop may decline or cancel any order or part of any order which it has accepted if circumstances beyond its control make it impractical or uneconomic to fill the order. Prices are subject to change without notice. Goods are sold at prices prevailing at the date of delivery. All prices are inclusive of GST and freight costs, unless otherwise stated and agreed by The Convex Mirror Shop in writing. Goods will not be shipped until payment has been received in full. Payment will not be accepted by any means other than Cheque, direct credit or credit card. Delivery of the goods will be deemed completed upon either receipt by or on behalf of the Customer or upon receipt by a carrier for delivery to the Customer. The Convex Mirror Shop will endeavour to arrange delivery according to schedule but any period or dates quoted for delivery are approximate only and The Convex Mirror Shop will not be liable for any delay. In the event of any happening beyond The Convex Mirror Shop’s reasonable control, and in consequence of which The Convex Mirror Shop cannot fulfil its obligations, The Convex Mirror Shop shall be entitled to suspend delivery or to exceed the delivery time of the goods concerned by the duration of such conditions and in the event of such suspension or extension, The Convex Mirror Shop shall not be liable for any damages or other compensation. All risk in the goods will pass to the Customer upon delivery. Ownership of all goods supplied does not pass to the Customer until payment in full has been received by The Convex Mirror Shop for all goods. Except as provided in any express warranty given by The Convex Mirror Shop, no warranty or condition shall be implied against The Convex Mirror Shop by any statute, at common law or otherwise and no representation, condition, warranty or variation of these terms will be binding on The Convex Mirror Shop unless it is in writing and signed by an authorised person on behalf of The Convex Mirror Shop. The Customer must notify The Convex Mirror Shop of any defective or damaged goods within 7 days of delivery and return the goods to The Convex Mirror Shop within 14 days of delivery if it wishes to make a claim. Goods must be returned freight paid. Failure by the Customer to comply with this clause will be deemed a waiver by the Customer of all claims in respect of such goods. Replacing or repairing the goods. 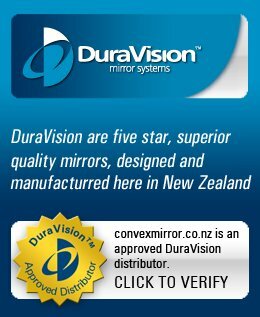 The Convex Mirror Shop will not be liable in any circumstances whether in contract, tort (including negligence) or otherwise to compensate the Customer for any loss, injury or damage arising directly or indirectly from any act, omission, error, default or delay of The Convex Mirror Shop or its employees or agents. The Convex Mirror Shop will not be liable if the Customer has altered or modified the goods or has subjected them to any unauthorised, unusual or non-recommended use, servicing or handling. This agreement replaces any other terms and conditions of trade between the parties.